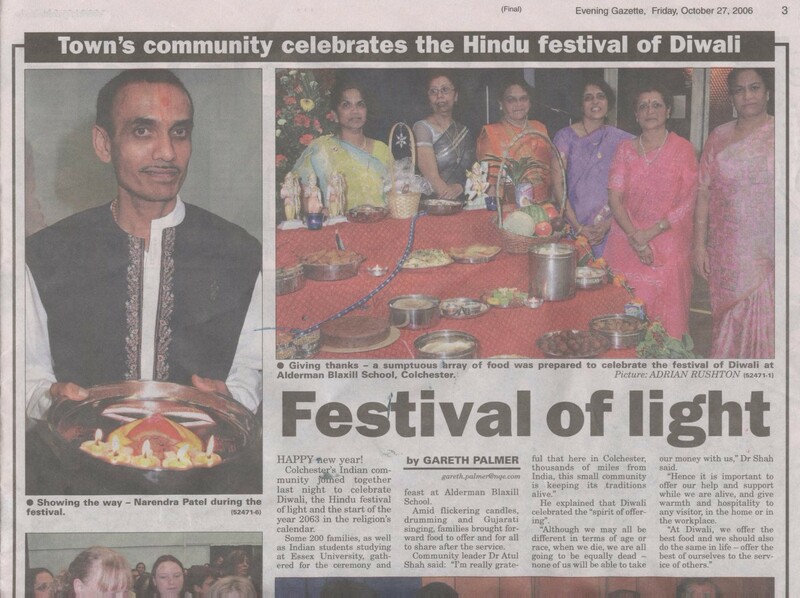 Colchester's Indian community joined to celebrate Diwali, the Hindu festival of light and the start of the year 2063 in the religion's calendar. Some 200 families, as well as Indian students studying at the University of Essex, gathered for the ceremony and feast held at Alderman Blaxill School. Amid flickering candles, drumming and Gujurati singing, families brought forward food to offer and for all to share after the service. Community leader Dr Atul Shah said: "I'm really grateful that here in Colchester, thousands of miles from India this small community is keeping its traditions alive." He explained Diwali celebrates the "spirit of offereing". "Although we may all be different in terms of age or race, when we die we are all equally dead - none of us will be able to take our money with us," Dr Shah said. "Hence it is important to offer our help and support while we are alive, and give warmth and hospitality to any visitor, in the home or in the workplace. "At Diwali, we offer the best food and we should also do the same in life - offer the best of ourselves to the service of the others."